If you want to improve your overall scores or at least shoot low scores when playing golf, you have to improve your putting game as it accounts for a significant portion of your score. On average, pro golfers will putt at least 95% of their 3-foot putts and around 50% from 8 feet away. While you do not have to match these statistics, you should aim to get as close to this as possible. And one of the first things you will need to do is to stop pulling your putts as you cannot be a good putter if you are unable to hit the ball straight. Pulling putts is a common problem that many golfers have to deal with, and it is where the putt misses to the right side of the hole (for right-handed golfers). This issue is often caused by golfers looking up and turning the body towards the hole as they swing through the ball. Below we look at the causes in more detail, and also provide some simple solutions. 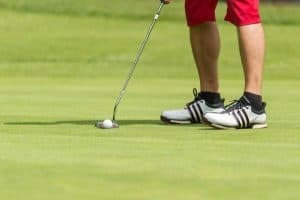 While the causes of pulled putts will vary from one golfer to the other and also depends on the skills and experience of a golfer, there are some common reasons why most golfers will pull putts. And they include the following three. Many golfers tend to assume that the only reason why they missed a putt that they were confident of sinking is due to a bad read or bad stroke. But, there is also another likely cause that many will overlook and not even think about which is aiming incorrectly. If you do not aim at the correct place when lining up for the shot and instead aim towards the left by mistake, you are likely to pull the putt even if you do everything else right. It is very likely that the only reason you pull your putts is that you did not read the green correctly. Besides the obvious things like understanding the distances to the hole, you also need to take into account the path that the ball will take towards it. Account for everything from the slope of the green to other things like tiny bumps and even the grass size to ensure that you understand the green. One of the biggest mistakes that you can make when putting is to watch where or how the ball is moving. It is very tempting to want to watch as the ball moves towards the hole, but lifting your head as you move through the shot often leads to a pulled shot. Also, the need to see where the ball is heading to also causes the right shoulder to move towards the ball when on the downswing and hence increasing the likelihood of pulling the putt. Now that you know some of the probable causes of pulling your putts, the next and most important thing to understand the possible remedies to this common problem. Luckily, there are many things that you can do, and most are easy and will only require regular practices. Here are some of the best ways to prevent putt pulling. Early head movement is a common cause of pulling putts because many golfers are eager to see where the ball is going. And so keeping your head still for long enough can be very helpful when dealing with pulling. Keep your head still and the eyes down through the swing until the putter comes to a stop. Avoid looking up immediately after hitting the ball because this can make you move your head sooner and hence pulling the shot. For right-handed golfers, excessive movement of the right hand can be the cause of pulling shots. And so instead of holding your putter with both hands take off the right hand and try putting with the left hand only. Well, it will be a little hard at first but with enough practice, you should master this technique. Hitting with the left hand only teaches you to use your shoulders to move the putter, and once you master this technique you can bring back your right hand into the game. But, keep in mind the technique you learned when putting with the left hand only and apply it also when using both hands. If you follow the two remedies above and practice enough you should be able to deal with the physical aspect of pulling putts, but there is still one more thing that you need to tackle to get rid of the problem. And this is the mental aspect. If you have been struggling with pulling putts for long, your confidence will take a beating. Physically, you might be doing everything right but you can still pull putts if your mental state is not right. But, there is only one solution for this which is practicing a lot because as you sink more balls you will be able to boost your confidence and develop positive feelings. There is nothing fun in pulling your putts consistently and it can be very disheartening. But, like with most other common golfing issues, you can also deal with this if you are ready to put in the work and address the causes. By first understanding the causes you will be on the right path towards eliminating the problem. With our three valuable cures above and enough practice, pulling your putts should be a thing of the past within a short time. Author Bio: While being a well-experienced golfer now, Brian Jame also works as an editor at a golf website to deliver tips and drills as well as buying guides to many other golfers. Stay tuned with https://lasergolfrangefinder.com// to keep yourself updated to the latest golf information!